Welcome to the website for the Catholic parishes of Cheboygan, Pellston and Riggsville in Northern Lower Michigan! United together as a parish cluster, the grace of God is sure to be found in the Church’s members here “up north.” God is made manifest not only in the beautiful surroundings, but also in the people who call the area home. 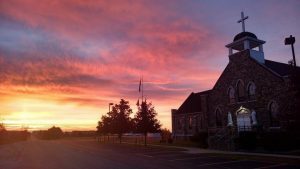 The roots of Catholicism, founding in the ministry of Bishop Baraga as far back as 1856, continue to spread wide throughout the entire region. First bringing Christianity to the Native American community, Frederick Baraga later served the religious needs of early settlers as well. We are proud and blessed to carry on the good works that began so long ago. I hope you will use this website to discover what our parish cluster has to offer in the areas of education in the faith as well as the many chances to access Mass and the Sacraments of the Church. Be sure to check out the history of each of our four churches, as well as our elementary school, as you peruse the pages of this site. If you are already a member of our parishes, you will find much needed information and updates on this site. If you are new to the area, I am sure that you will find the love of Christ alive in our communities. If passing through as a visitor, know that you are welcome to partake in all of the things that we offer in our part of the Diocese of Gaylord. We envision a faith community inspired by the Holy Spirit, by actively listening to the Word of God and being nourished by the Holy Eucharist. We proclaim with joy and love of God that all who witness it are drawn to it and there discover saving grace. As One, Holy, Catholic and Apostolic Church, united by our faith Tradition taught by the Word and strengthened by the Eucharist; we are sent forth by Jesus and empowered by the Holy Spirit, to proclaim the Gospel to all. 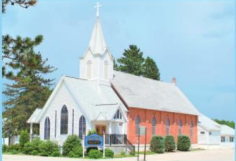 The Catholic Church in Cheboygan is the oldest continuous religious organization in our community. Its roots date back to the early missionary activities of Fredrick Baraga, who established the first church here in 1859. That church was located near where Calvary Cemetery is today. Because most of the early settlement in the area was focused around the mouth of the Cheboygan River (and Duncan Bay), the expanding population needed a place to worship much closer to home. With that, ground was broken on the parish’s new (and current) building in 1869 and completed in 1875. 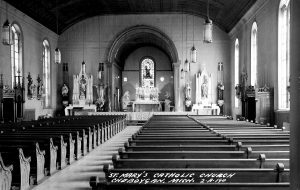 St. Mary was the largest single religious congregation in the bustling lumbertown. Originally located on the corner of what is now State and D Streets, in 1898 the entire building was slowly moved to its present location. Plans to build a new church on the former site never materialized. In the mid 1920s, a large porch was added to the structure. Due to the rising number of French and Polish immigrants, members of these ethnic communities sought churches of their own. Thus, in 1895 the French members formed St. Charles Parish; in 1896 the Polish members formed St. Lawrence Parish. Both schools, along with St. Mary, all had their own schools for a time as well. St. Lawrence Parish closed its doors in 1966, and St. Charles was combined with St. Mary to form a single community in 1989. Today, St. Mary/St. Charles is home to a thriving religious community as well as a parish school. Its history is as deeply entwined in the history of Cheboygan as the people who built her. We, the Catholic Parish of Sacred Heart, within the Diocese of Gaylord, undertake to form a community of faith, hope and love through active and meaningful participation in liturgy. Our mission is to spread the Good News of the Gospel by serving our brothers and sisters in our daily lives within our local and worldwide communities. The first Catholic service in 1878 was held at the Janiszewski home located close to the intersection of Richardson and Polish Line Roads by a missionary priest name Fr. Malkowski. In 1889 the Polish Catholic community built the original church on the current site today. This church had a rectory and the upstairs was a Polish School. It was hit by lightning and burned in 1918. In 1919 the Church was rebuilt and local craftsmen added the beautiful stone walls. In 1965 Sacred Heart was made a Mission Church. In 1979 the rectory and school were torn down. Sacred Heart was scheduled to be closed in 1992, but the Parish refused to let this happen! After much prayer, daily meetings with the Diocese and a church sit-in, Bishop Cooney granted permission in November of 1992 to allow the Church to stay open. The Church grew and in 1998 a building addition completed the long journey to the rebirth of the Church. Today the beautiful stone church on the hill remains a testimony to the faith, prayers, and persistence of the parishioners. It has withstood the test of time. St. Clement Parish is a Catholic Community striving to recognize and address the needs of those around us by living the Good News of the Gospel. Through active prayer and sacramental participation we will strengthen our lives to enable us to perform our ministries effectively and bring both believers and non-believers into the one fold of Christianity. 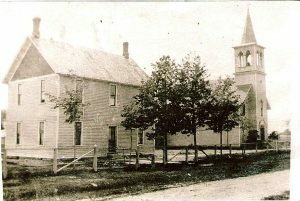 Parish records for St. Clement begin in 1901, though construction on a church would not begin for another seven years. Mass was celebrated in homes or wherever convenient. Initial plans were to but a church in Brutus, but a wind storm knocked down the walls before completion and that project was abandoned. In February 1908 four lots were donated by Pellston resident Colonel Bogardus for a church and school. Construction began in 1908, but was halted in that fall due to a lack of funds. By the spring additional resources had been obtained and construction resumed. 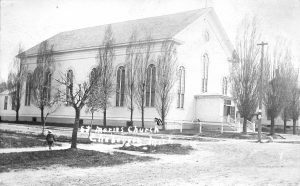 On October 10, 1909, the first services at St. Clement were held. A year later a belfry and steeple were added, as were new seats and an altar. In the early 1950s the parish hall (Quonset) was completed for use as a place for annual dinners, bingo, catechism classes, etc. Extensive remodeling began in 1973 with the addition of the sheltered entrance at the front of the church. Today, St. Clement continues to serve as an anchor in the community and an anchor of local faith. Saint Mary Church at Burt Lake is closely connected with early native American history. Saint Mary Church was and perhaps still is called the Indian Church. The present location of the church is connected with the dispossession of the native Americans from their reservation land on Indian Point. Indian Point is now called Colonial Point because of the Colonial Hotel on the land near Harbor Springs. In 1900, the Indians and their belongings were forcibly moved to the road and their houses set on fire. Twenty-five Indian families were left homeless. With no place to go, the Indians moved to “Indian Road.” Today only a small burial ground remains where the Indian Village once stood. The present church building was constructed in the years 1909-10 and dedicated by Bishop Richter July 5, 1910. The present site is the second site of Saint Mary Church. There was a church opened two miles south. Since the Indians neglected to pay taxes, someone paid the back taxes and secured the title to the land where the church was located. The new owner had the Indians evicted. The native Americans lost their property, their homes and even their cemetery. After that, Mass was celebrated in private homes. Funds were slowly raised and land was donated for the church building. That was the church building dedicated July 5, 1910. In the mid-1960s the center mosaic of the Assumption of the Blessed Virgin Mary was put in place along with other mosaic pieces done by Fr. Hilary Wiemels, OFM. Though now used infrequently, the parish remains an important fixture in the life of many area residents and their cultural heritage. Partially taken from Saint Mary, Burt Lake in These Very Stones Cry Out by Father Stanislaus Bur.